Remember this amazing viral video captured by a security camera a few years ago? As a little boy sat on his bicycle in his Bakersfield, Calif., front yard, a neighbor’s Chow/Lab mix ran at him, bit his leg and pulled him to the ground. The boy’s mom ran to save him. But before she could reach him, like a superhero from out of nowhere, the family’s cat, a 7-year-old Tabby named Tara, pounced on the dog and chased him away. 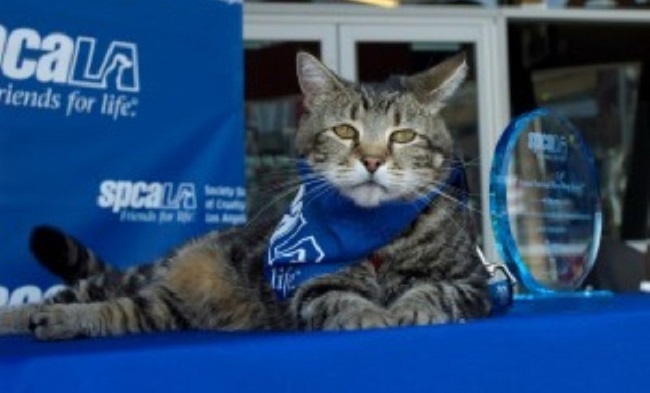 For the first time ever, in 2015 the Society for the Prevention of Cruelty to Animals Los Angeles (spcaLA) gave its annual National Hero Dog honor to a cat — Tara. “We were so impressed by Tara’s bravery and fast action that the selection committee decided that a cat this spectacular should be the National Hero Dog,” spcaLA President Madeline Bernstein said in a statement at the time. Tara and her family will be aboard the Lucy Pet “Paws For Life” float, which honors heroic animals who saved, protected and made a difference in human lives: specifically, three dogs and one cat. Lucy Pet is a family-owned pet-product business based in California. Its proceeds help fund the nonprofit Lucy Pet Foundation, whose mission is to reduce pet overpopulation and the euthanasia of over 60,000 dogs and cats per week in the United States. Sirius, a retired K-9 military working dog who was in Afghanistan with his best friend and handler, 22-year-old Marine Sgt. Joshua Ashley, when Ashley was killed by an IED. Although the German Shepherd was also injured, he returned to Afghanistan again for an additional tour of duty. Sirius was adopted by Ashley’s family and will ride the float with Joshua’s mom, Tammie, in memory of her son. Jax, a Belgian Malinois police dog with the Oxnard Police Department in California. During a recent routine traffic stop, Jax sniffed out 5 pounds of methamphetamine disguised to look like a wrapped birthday gift. He also apprehended a man trying to set a homeless encampment on fire. Rocket, a Border Collie mix who was going to be euthanized by a shelter due to his high energy level (what?!). Fortunately, a Search Dog Foundation recruiter saw his potential and rescued him. Rocket now pays it forward by saving victims who become trapped during natural disasters, including Hurricanes Harvey and Irma, and the Northern California wildfires this past year. Actor, animal advocate and totally cool guy Danny Trejo will also be riding on the float with his rescue dog, Penny Lane. High above the float is a replica of an Army Black Hawk helicopter, from which a highly specialized military working dog team will demonstrate a tandem rappelling operation during the parade. At the center of the float is “a rotating hexagon, with eight magnificently detailed floral-graphs, featur[ing] many inspiring photographic moments of heroic pets and working canines,” according to the Pasadena Star-News. For the 2017 Tournament of Roses Parade, the Lucy Pet Foundation’s “Beachside Paradise” float, featuring eight surfing dogs, broke two Guinness World Records as the parade’s longest and heaviest float ever. The 129th Rose Parade begins at 8 a.m. PST on Jan. 1. You can watch it live on ABC, NBC, the Hallmark Channel, HGTV and other channels.